Attorney Charles R. Taylor has been practicing law in California since 1990 and operating the Law Offices of Charles R. Taylor in the Valencia community of Santa Clarita since 1996. He focuses exclusively on California divorce and family law, emphasizing straightforward counsel and a practical approach to reaching negotiated solutions to complex problems. 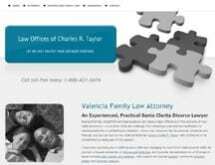 Charles R. Taylor is a proven lawyer for people throughout the Santa Clarita and San Fernando Valleys who need skilled representation in divorce, child custody disputes, post-divorce modifications of child support or other orders, paternity matters and domestic violence cases. He also has extensive knowledge of current laws covering restraining orders, parent-child reunification and other specific, high-stakes family law issues. Recognizing the serious emotional and financial pressures that come with divorce and other family law challenges, attorney Taylor focuses on helping people understand relevant laws, make sound decisions and work toward resolution without unnecessary animosity or litigation costs. He is adept at developing creative compromises to suit unique family circumstances, navigating the court system and protecting children's' and parents' interests. Attorney Taylor's experience across the spectrum of California divorce and family law, combined with his business education and financial savvy, are tremendous assets for men and women who must overcome pivotal life issues and plan for the future. This law firm offers a free, focused half-hour attorney consultation to talk through client needs and legal options, and the firm accepts credit card payments for its services.